1.Prepare Chicken: In medium bowl, whisk together all ingredients except chicken. Divide chicken into large zip-top plastic bag; pour 1-1/2 cups marinade into bag. Seal bag, pressing out excess air; refrigerate up to 4 hours, massaging bag occasionally to distribute marinade. 2.Meanwhile, prepare Rainbow Slaw: In large bowl, toss all ingredients with remaining marinade until well combined. Cover and refrigerate at least 1 hour or up to 4 hours before serving. 3.Prepare outdoor grill for direct grilling over medium heat. Remove chicken from marinade; discard marinade. Place chicken on hot grill rack; cook 22 to 25 minutes or until internal temperature of chicken reaches 165°, turning several times during cooking. 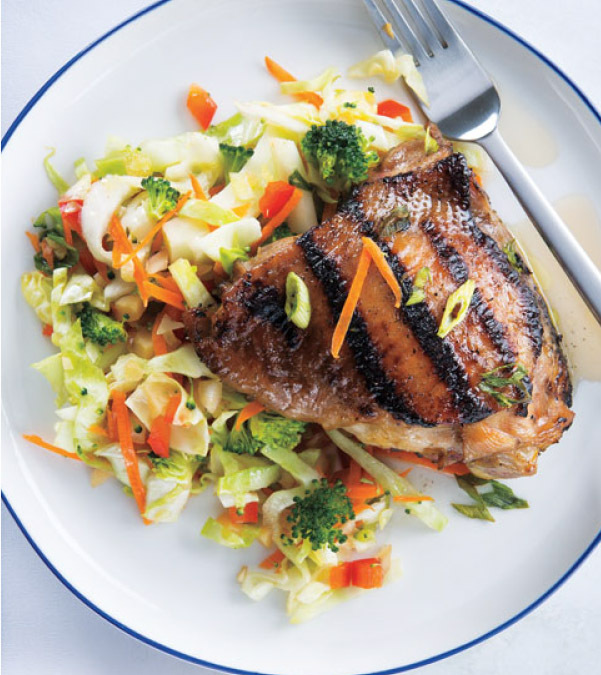 Serve chicken with slaw.